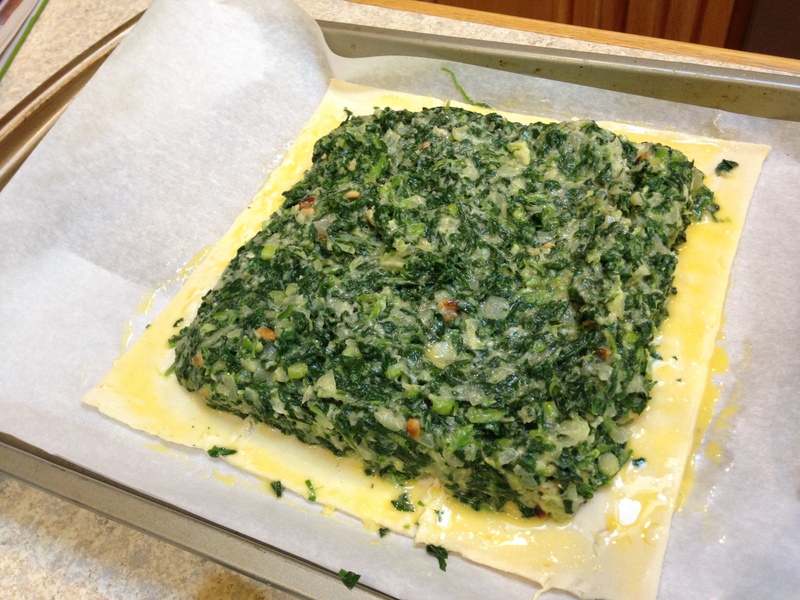 I have made this Spinach pie many times, it’s great for a meal or can be cut up in smaller bites for appetizers. I got the recipe from Ina Garten”s Barefoot in Paris. Here is the recipe with some of my tips. To me cooking is all in the organization. Always read the recipe thoroughly , can’t tell you how many mistakes I’ve made by overlooking a step. Now all recipes start telling you to preheat oven, my oven only takes 10 or 15 minutes to preheat so I usually do that when I’m almost ready to put in the oven. I place a colander in the sink and use lay a cheese cloth on top then place the spinach on it, wrap it in the cloth an squeeze all the water. You can use a towel but it can be a little messy, I throw the cloth out. Place the spinach in a large bowl and set aside. Melt the butter in a saute pan and add the copped onions. Cook for 5 to 7 minutes till tender. At this time a toast the pine nuts over medium heat till they start getting some color since I am already at the stove. Add the garlic and cook till 1 minute more. Add the onion mixture, pine nuts, scallions, the cheeses, the eggs. bread crumbs, salt and pepper, nutmeg to the spinach and mix well. I mix well every time I add and ingredient. Unfold one of the puff pastry sheets onto a baking sheet lined with parchment paper. Keep the pastry sheets cold before use or it will be hard to unfold as it will stick. Now you can PREHEAT OVEN to 375 degrees. Spread the spinach mixture starting in the middle leaving 1 inch border. Brush the border with the egg wash. Roll out the second piece of pastry on a floured board till 1 inch each larger in each direction. Place it over the spinach and crimp the sides with a fork. Now what I found is that it helps to have a flat baking sheet it will be easier to crimp. Brush the top with the egg wash but don’t let it drip or the pastry won’t rise. Make three small slits in the pastry and sprinkle salt and pepper. Now bake for 30 to 40 minutes, depends on oven till golden brown. Thanks for liking my recipe for Kale and Garden Vegetables Stir Fry. This spinach recipe looks delectable. Love this idea! I’ve done the small pastries before, but love how simple this is to just cut into slices!